Ever since I moved to Midtown Manhattan, I griped about it being a dead-zone after work and on the weekends, but lately it seems a bunch of cool spots are popping up in the area! Yay! 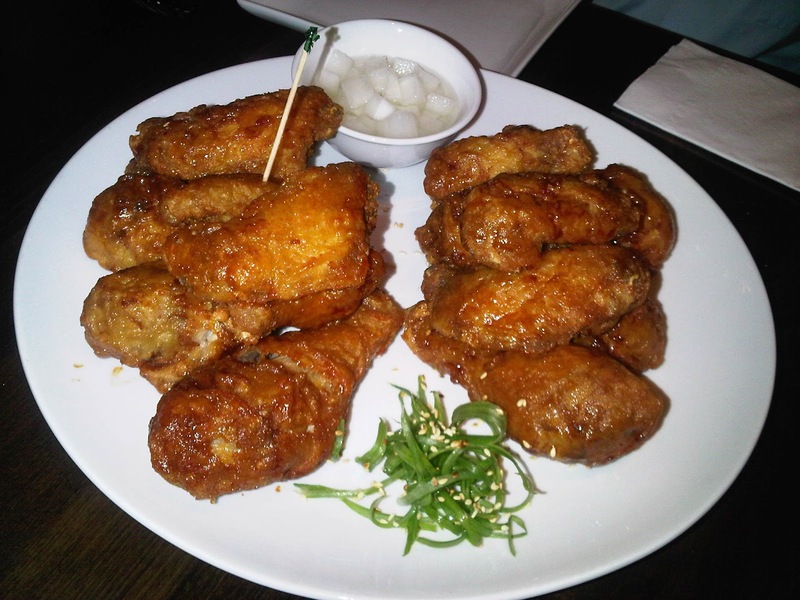 BonChon opened up a branch on 2nd Avenue between East 50th and 51st Streets, which is a great after-work spot for all the offices nearby. BonChon makes a.m.a.z.i.n.g fried chicken. How? Because the chicken is double-fried. As if frying it once isn't enough, they up it a notch. My favorite part of fried chicken is the skin. I'll leave chicken on my plate if I'm stuffed, but never a piece of crispy goodness! Compared to other BonChon locations, the menu there is very limited since they're still pretty new. Hopefully they add more soon, but in the meantime try the chicken! I usually get a combo (mix of wings and drums) half Soy Garlic flavor, and the other half Hot. I recommend both flavors - the Soy Garlic is slightly sweet, but the Hot definitely has some heat! Small Combo (10 wings & 6 drum sticks) with half Hot and half Soy Garlic. Served with some radish to cut through the heat from the spicy chicken! They have lots of beer on top, I think 20 different kinds, and for $15 a pitcher you can't go wrong! There is also $5 Sangria and $3 Coors Light. It's a great spot to meet up with friends/coworkers/family (my cousins love it too!). The food is affordable (and delish) and the beer is cheap. Go check it out!